This entry was posted in Research studies and theory and tagged Booz Allen Hamilton, Brazil, British Council, China, communication, Cross-cultural communication, cross-cultural skills, Cultural Detective, diversity and inclusion, Education and Training, global business effectiveness, India, Indonesia, intercultural competence, Jordan, Race and ethnicity in the United States Census, South Africa, United Arab Emirates, United Kingdom, United States by Dianne Hofner Saphiere. Bookmark the permalink. Thank you Dianne for sharing this research. I think it is important during the new employee onboarding process to have formal training on corporate culture and how it is translated into the specific local or regional culture. 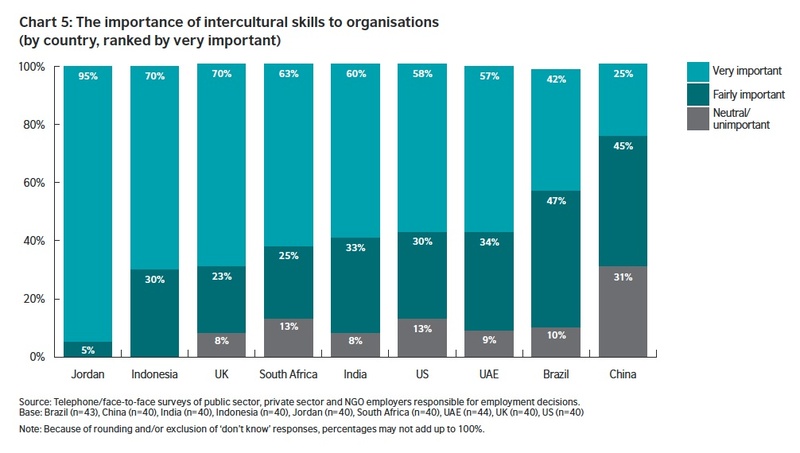 It is also important to provide formal education on intercultural communication and emotional intelligence for global managers leading multicultural teams. Yes, what you say is very true, Anne. This research did not appear to include a look at corporate culture; rather it was focused on the skills employers would like employees to have, those that make a difference in the workplace. In that sense it’s a terrific answer to the question about the business case for intercultural. It is notable that corporate culture was not mentioned, though of course we all know organizational culture as well as cultural understanding of one’s personal values are so key. Creating a “team culture” is, of course, also crucial to high performance. Sincere thanks for sharing this research. So much of what we do can seem to be underestimated. It’s always good to get the conversation going around our passion: cultural intelligence. Next is to loo at the complexity of the layers of culture( as you mention): global corporate culture, national, local corporate culture, functional, team, etc. So glad you find it helpful, Maureen and Donna! Thank you for taking the time to let me know! I must say I enjoy making stuff like that. But I’m one of those “crafters” who likes to know the chachke is getting used! lol Now a video around the layers of culture, Maureen, hmm…. Thanks for this posting, Dianne. I’d seen this article and posted it on LinkedIn, but you’ve really made it come to life with the graphics! And of course the wonderful clip – Wow! Am happy to do a version in Japanese if you’d want to send the verbiage. Happy anniversary, btw! Congratulations! Great video and encouraging to see how reaserch is confitming the real value of intercultural skills! Thank you for sharing! Diane, Thanks for posting the article in LinkedIn, plus your video, terrific resources. I noticed “Build Trust” as #2 in value ranking/importance. We are looking into this in business, but also in our beloved Venezuela where trust is on the line daily as the 14th April election fraud is being evaluated daily – – thus, trust is much on my mind, and jumped out at me in the report. What do you think it takes to build trust across cultures? Marian, I’m very happy to know you are conducting some research in the area of trust across cultures. It is, of course, hugely important. I feel there are culture-general components of trust: someone we feel confident in, someone we can be honest with, someone we can be authentically ourselves with, etc. Then there are also the culture-specific aspects of trust: how we demonstrate and build the above, for example. The Values Lenses in our CD series provide a wealth of culture-specific information on how trust is established and maintained differently in different cultures. I look forward to reading the results of your research! Yesterday, I was running a one day cultural induction program in a major pharmaceutical company for a newly hired senior scientist. The initial program was completely turned upside down since the key focus of that person was on how to enhance daily working situations. His business environment is both real and virtual and the challenges he is facing are underlining the importance of creating trust, engagement and alignment together with the necessity of building personal credibility. The study you share Dianne is great and I would have appreciated getting it prior to my session. What this study highlights is exactly what my client’s concerns are. I’ll pass him the link since this could be a perfect follow up information on what we discussed. Interestingly, the client said that emotional intelligence development should be associated to cultural understanding and adjustment since both are intimately intermingled. Openness, Trust and respect were among his priorities… he confirms the study. Thank you for sharing this experience, Olivier. Trust and how we demonstrate it, build and maintain it across cultures and even within our own families is, indeed, key. And far from easy. Best wishes to your client. The survey is interested in many respects for the beliefs and assumptions it propagates. Check out the ‘intercultural skills’ taxonomy referred to and, interestingly, culture explicitly forms only two dimensions and I am very sure that ‘culture’ is the construct of ‘national culture’, something academic research is increasingly discrediting as a organising category. Importantly, what is left out with respect to business professionals is the systemic understanding of corporate reality – roles, KPIs, global-local issues – as determinants of behaviour and thinking, an environmental perspective (financial crisis and business model collapse with the arrival of digitialisation) and, probably more importantly, a situational approach to competence as opposed to universalist ideals of ‘acceptance’ and ‘flexibility’. It’s all in the right area but is missing context and credibility for our clients. Indeed, Bob, there is a dearth of solid research in this area, and every study, by its nature it would seem, has shortcomings. What are some of your favorites?